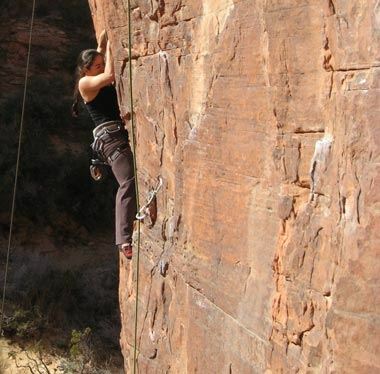 Climbing in Red Rock Canyon is an addictive sport. The steep overhanging cliffs become a monstrous feat that one must, at all odds, overcome. Day after day, hour after hour, you battle the rock holds, sometimes spending a week just to master one tricky maneuver. But when you finally get to the top, the whole world rolling out beneath you, you remember why you deal daily with the scratches, rope burn, tight shoes, heavy packs, and tendonitis. It’s all worth it.